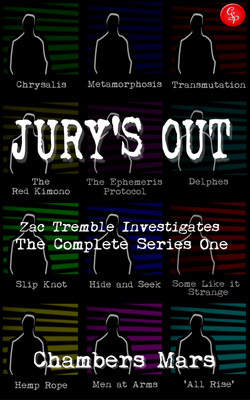 Jury's Out is the single volume which contains all twelve cases of the first series of Zac Tremble Investigates. Zac is young, lusty and gay. The stories have an adult theme, aside from the cases being investigated. The descriptions of the sexual relationships are not especially graphic, but they are, nevertheless, a feature. The twelve individual case files are also available as well as the books published in Series 2. There is also a Zac Tremble Investigates novel series. The first novel, Pot, Kettle, Black, has been published.